Books in their traditional form are becoming redundant due to technological replacements. 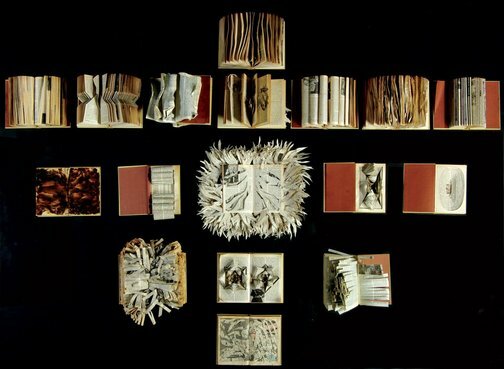 My body of work aims to recontextualise books, to bring attention to their aesthetic qualities, to surprise the audience by manipulating them and disregarding their conventional function. My work also explores the distortion of information that happens through the undiscerning use of information technology. I used old encyclopedias as they are seen as obsolete in our cyber world. Today’s masses, especially the youth, are so reliant on technologically driven modes of information for knowledge and this lead me to attempt the 're-introduction’ of books in a different form. Investigate all the processes through which Maria Millare has transformed the purpose and function of the book to re-introduce them to an audience. Identify possible reasons why she has chosen to liberate old, traditional forms of knowledge in the 21st century. Consider your own use of books. Are they your first choice as a source of information? Discuss this and conclude what the top three might be globally. Consider the use of books in Svetlana Kopistiansky’s work. Outline how they have been manipulated and presented to the audience. Is she using the books for symbolic purposes as well? Interpret the relationship between the sporting equipment and books, and research the link the artist is making to the Soviet culture in which she grew up. Propose parallels between the way information was managed in that culture and Millare’s view of information today.